As a health-conscious person, you’re probably always scrutinizing the ingredients list of any food you buy. You look for foods that are free from complex-sounding chemicals and artificial dyes, and you’re careful to avoid anything that has ingredients you’re allergic to. But do you take a similar approach with your toothpaste? As your family dentist in Longmont explains, it’s important that you know what you’re using to keep your smile clean and fresh. Sodium lauryl sulfate. This is a foaming and cleaning agent, but it can also irritate the sensitive soft tissues in the mouth and perhaps lead to canker sores. Sodium laureth sulfate. The human liver can’t metabolize this substance, so it can stay in the body’s tissues for quite a long time. It is a potential carcinogen and may lead to hair loss. Triclosan. This substance helps to fight bacteria and prevent gum disease, but some research suggests that it can cause developmental harm. However, the negative effects remain unproven. Hydrated silica. This grainy substance is commonly known as sand (yep, exactly what you would find on a beach). It is a mild abrasive that helps to remove plaque. Fluoride is toothpaste’s most famous ingredient, and there are many varying opinions around this mineral; many naysayers claim that it is a poison that can lead to long-term negative health effects. But is that really true? In fact, fluoride is an essential part of maintaining a healthy smile because it helps to remineralize teeth. As long as you don’t ingest large amounts of it, there is little to no risk that it will cause you any harm. The FDA regulates many types of toothpaste, as does the American Dental Association. If these organizations approve of a specific type of toothpaste, you shouldn’t worry too much about using it. Even if a toothpaste has some of the above ingredients, rest assured that they are present in very minimal amounts. Still, it’s wise to look at the ingredients list of your toothpaste and do some research on any items that you’re not familiar with. If you find anything that worries you, you might want to start shopping for a natural toothpaste alternative. 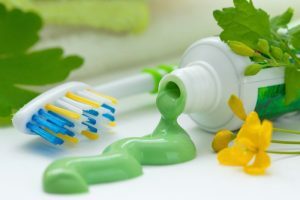 If you do go the natural route, however, be aware that many “natural” toothpastes contain herbal extracts to add flavor. While herbs aren’t necessarily harmful, not everyone reacts to them in the same way, and they may have unexpected interactions with certain medications. Your best resource for choosing a safe, effective toothpaste is your dentist in Longmont. They can recommend a product that is good for your smile and answer all your questions about whether a specific product is safe to use. Do you know what’s in your toothpaste? Check out the ingredients list so you can clean your teeth as an informed, health-conscious consumer. Dr. James A. Maurer is proud to serve as your family dentist in Longmont. He has many years of experience, and he is happy to share is knowledge with his patients. If you have questions about your toothpaste or anything else related to your oral health, please contact our office at 303-776-2214. Comments Off on What’s in Your Toothpaste?